Jean-Baptiste Lagimodiere (1778-1855) entered the fur trade as a voyageur around 1800, probably with the Northwest Company; he returned to Canada in 1805 and married Marie-Anne Gaboury the following year. 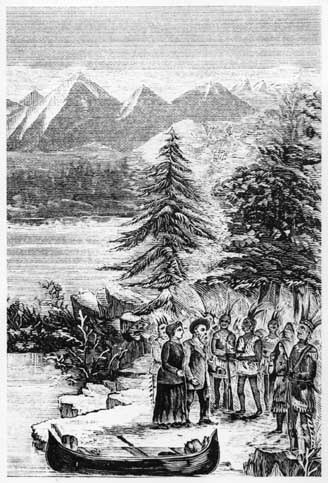 The couple soon embarked for the west, where Jean-Baptiste hunted, trapped, farmed, and frequently acted as a messenger for the Hudson's Bay Company. This drawing depicts an artist's impression of the couple meeting with some aboriginal people. Read more about Jean-Baptiste or Marie-Anne - enter 'Lagimodiere' or 'Gaboury' in the search box to your left. Check the Beaver Index - e.g., Lagimodiere, Gaboury, Red River settlement, etc. Jean-Baptiste and Marie-Anne settled in the Red River Settlement and farmed successfully there for many years. Their daughter, Julie, married one of their neighbours in 1844: Louis Riel Sr. Later that year, she gave birth to a son, Louis Jr, who would grow up to be a celebrated and controversial Metis leader.